Kwame Alexander is a poet, educator, and the New York Times Bestselling author of 28 books, including Rebound, the follow-up to his, Newbery medal-winning middle grade novel, The Crossover. Some of his other works include Booked, which was longlisted for the National Book Award, The Playbook: 52 Rules to Help You Aim, Shoot, and Score in this Game of Life, Swing, and the picture books, Out of Wonder and The Undefeated. A regular contributor to NPR's Morning Edition, Kwame is the recipient of numerous awards, including The Coretta Scott King Author Honor, The NCTE/Charlotte Huck Honor, Three NAACP Image Award Nominations, and the 2017 Inaugural Pat Conroy Legacy Award. He believes that poetry can change the world, and he uses it to inspire and empower young people around the world through The Write Thing, his K-12 Writing Workshop. Kwame is the founder of Versify, an imprint of Houghton Mifflin Harcourt, and the host and producer of the literary variety/talk show, Bookish, which airs on Facebook Watch. He's led cultural exchange delegations to Brazil, Italy, Singapore, and Ghana, where he built the Barbara E. Alexander Memorial Library and Health Clinic, as a part of LEAP for Ghana, an international literacy program he co-founded. 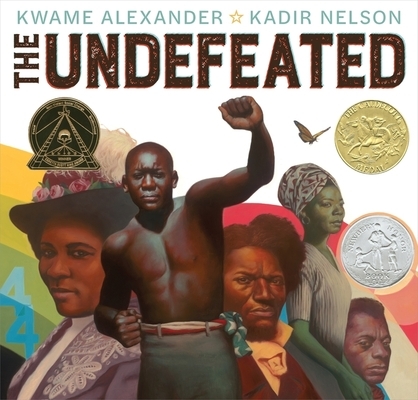 Kadir Nelson is a two-time Caldecott Honor recipient. Among his other awards are an NAACP Image Award, and the 2009 and 2014 Coretta Scott King Author Award. His work has appeared in The New York Times, Sports Illustrated, and The New Yorker. He lives in Los Angeles, CA.